You love the idea of starting a blog. But…you’re not sure what to write about. Or maybe you have an idea, but you’re not sure if it will work. Sound familiar? If you’re nodding your head, you’re definitely not alone. Choosing a blog niche is one of the hardest parts of starting a blog – it makes all the technical stuff seem like a cake walk in comparison! You might have a million ideas bouncing around your head. Or, you might be struggling to come up with just one. No matter what your roadblock is, I’m here to help you zero in on the perfect niche for your new blog. You’ll learn the three questions you need to answer to come up with a blog niche that you can grow, stick with, and maybe even monetize down the road. And if you’re still struggling with how to come up with a blog niche in the first place, I’ll also share some tips for starting from ground zero, as well as 100+ great blog ideas to jumpstart your creative juices. 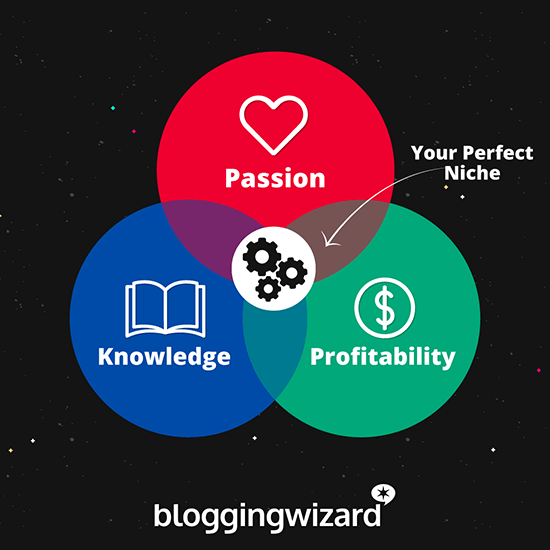 Why do you need a blog niche, anyway? Let’s start at the beginning – why does this even matter? The purpose of a blog is to share your thoughts and ideas with the world, right? So why can’t you just…share your thoughts and ideas as they come to you? Basically – why do you have to pick a single niche? Well, there’s no Internet police that will come break down your door if you don’t stick to your niche. And there are people who’ve found success with a more scattered approach. Your readers aren’t guaranteed to be interested in all the topics you personally love. So unless you can make you yourself the topic of the blog (which is possible, mind you), it’s difficult to build an audience that way. On the other hand, if you stick to one topic, you can guarantee that people who are interested in one of your posts have a high chance of being interested in all of your other content, as well. What is a niche exactly? 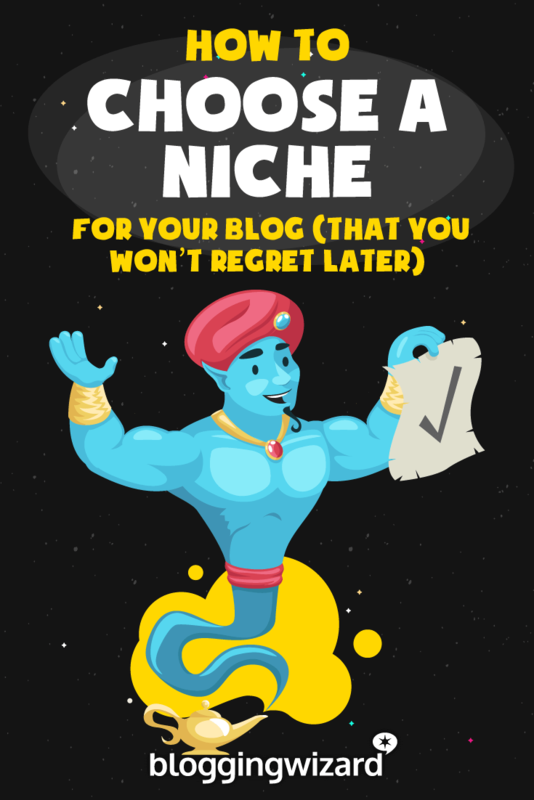 A blog niche is a specific topic you’ll write (or create other types of content) about on your blog. Now, the problem is everyone has a different idea of what a “specific” topic is. One of the first blogs I worked on was a video game blog. We worked on it heavily for a few years and struggled to grow it. We were trying to create content for everyone who was interested in gaming. Just like thousands of other publications, bloggers, and YouTubers. So, what was the lesson in all of this? When you decide on your blog niche, you need a clear understanding of who your target audience is. Instead of writing for anyone that was into gaming, we needed to get specific about our ideal audience. The gaming industry is massive. If we just carved out a small chunk of that, it would have been incredible. So instead, we could have picked a specific type of game and owned it. Something like MMORPG’s, platformers, real-time strategy, first-person shooters, etc. Fun fact: we were the first site in the UK to get access to the Oculus Rift, but VR was a bit too fresh at that point to create much content around it. I’m often asked whether tech is a good niche, so let’s use that as an example. If I were starting a tech blog, I’d look at the different types of people that would buy devices for specific purposes. And these examples would fit a lot of other niches too. A blog about freelancing, could focus solely on graphic designers. Or a blog about personal finance could be focused around helping freelancers. If the topic you choose is specific on it’s own, you should be good to go. For example, I’m guessing if you started a blog for food truckers, that’d probably be specific enough. Consider your future goals, too! When starting a new blog, I like to keep the blog name fairly broad so I have the freedom to expand my target audience without rebranding (checkout David’s post on choosing a blog name if you need help with that). Yeah, rebranding would be a pain! You don’t have to do this, but, I wanted to mention it because a lot of people don’t consider this until after they launch. Where does that niche come from? At this point in the process, you just need to brainstorm. Yeah, you do want to validate your ideas eventually, but let’s leave that for the next section. For right now, don’t worry too much about feasibility and just come up with a big list of topics you think you might want to blog about. Your room/house. Just look at the objects you own and see if any of them spark an idea. Your daily life. Same idea – think about what you do on a daily basis and see if anything pops out. Amazon, eBay, and other shopping sites (look at the popular products, categories, or your order history). Don’t worry if you’re still stuck – I’m going to give you a big list of 100+ blog niche ideas at the end. Now, you hopefully have at least a few ideas of what you want to write about. Next, you need to validate those ideas to find the best one for your blog. Pick a topic that you’re passionate about with products that you can sell to make money…but no one else is interested in it, you’re never going to build an audience or earn an income. Choose something lots of other people like but you’re not interested in, you’re going to struggle to keep writing blog posts in the future. Go with a topic that you love and that also has a huge audience…but no money-making opportunities, then you might become popular, but you won’t earn an income (this one actually might be OK – it depends on your goals!). Question 1: Will I love writing about this one year and 50+ posts from now? This is the big one. The Internet is littered with blogs where people start off strong, publishing posts every week for the first month or so. Pretty soon it’s one post every month. If you read blogs, I can guarantee you’ve seen that pattern play out again and again. This isn’t meant to be a negative value judgment on those people – it’s just a testament that consistently blogging about a topic is hard work. It’s a lot easier to be passionate about a topic once you start to see some success. You can always hire other writers or accept guest posts if your internal engine runs out of steam. Question 2: Are there other people who want to read about this topic? If you’ve made it through the first question, you know there’s at least one person interested in your blog’s niche. Now, it’s time to figure out whether there are any other people who want to join in on the fun. Thankfully, this is an easier question to answer because it’s less soul-searching and more research. It’s not the deepest analysis, but it’s a great place to start and it’s really easy to use. That image above shows that, while interest in the paleo diet seems to have waned a bit, it’s still a pretty popular topic. You can click the question mark next to “Interest over time” for an explanation of what the numbers mean – it’s all relative. And look at that! 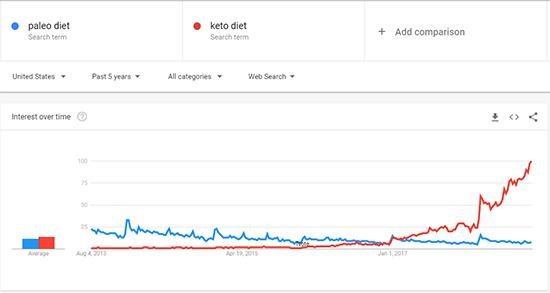 So now – if you’re interested in both the paleo diet and the keto diet, you already know that keto is much more popular in 2018, which means that it’s probably a better bet if you’re planning to start a blog today. Ok, so now you have a rough idea of your niche’s popularity and momentum from Google Trends. 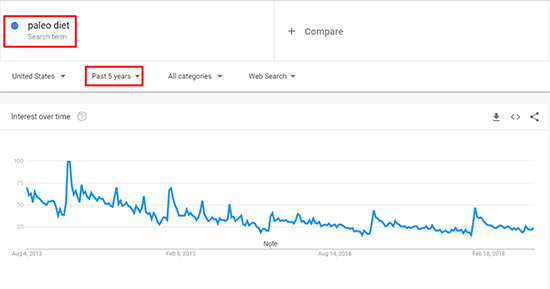 But because Google Trends uses relative numbers (remember – the key is “trends”), it’s not the best guess of absolute numbers. That is, it doesn’t tell you exactly how many people are searching for terms in your niche right now. That’s why you have to go a little deeper with keyword research (if this term is new to you, check out our beginner’s guide to keyword research). Basically, keyword research will tell you exactly how many people are searching for terms (“keywords”) in your niche every month. There’s no hard rule here – but generally, you want your main search terms to have at least several thousand searches per month. If there aren’t that many people searching for the main terms, it will be difficult to come up with lots of blog post ideas that people are interested in. Question 3: Can I make money from this niche? Whether the niche is something you can stick with. If other people are just as interested as you are. Now, it’s time to figure out whether you can actually make money from this thing. If you’re creative, it’s possible to make at least some money from pretty much any niche, as long as you have an audience. For that reason, this is probably the least important of the three questions. Some blog niches are always going to make more money than others. So how do you figure out if, and how, you can make money with your niche? You guessed it – more research! Your first stop should always be to see how other blogs in your niche are making money. Go open a few tabs with popular blogs in your niche. This should instantly give you some idea of the potential monetization options available to you. 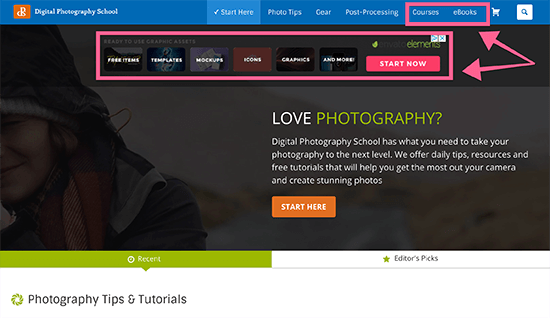 Digital Photography School sells eBooks and courses, as well displaying ads. There’s a few monetization ideas right from the homepage! Although, displaying ads isn’t always the best way to go. It does work great in certain verticals though. Amazon is a gold mine for monetization ideas. Create similar products for your own blog (if it’s something like an eBook). Write blog posts to promote high-quality products and get paid a commission (for physical products). Affiliate marketing is a partnership where you get paid a commission for referring people to products. Amazon is one popular affiliate marketing opportunity, but you also might have niche-specific opportunities that can provide a great income. To try and find them, look up popular products or stores in your niche. Then, Google something like “Store name + affiliate program”. If all goes well, you should be able to find some high-quality products you can promote and make an income. This method requires the most upfront work, but it can really pay off if you do it right and have a large audience. Basically, you create your own digital product – like an eBook or an online course. Then, you sell that product to your audience. If there’s any way you can add value – either by teaching or just compiling resources – this can be a great way to monetize a niche. Need some help starting your blog? Be sure to check out my complete beginner’s guide to launching a blog. At this point, I hope this section is completely irrelevant! But I know just how difficult it can be to come up with a blog niche idea and I want to help. Just be sure to always consider your target audience – especially if your niche is fairly broad. Note: you’re welcome to save this image to refer back to and even feature it on your own blog (just be sure to link back to this post if you do). And if all else fails, you can always blog about…blogging!